Back in 1919, the United States of America ratified the Eighteenth Amendment to its Constitution, bringing about the prohibition of alcohol. What were they thinking?! Fortunately, on December 5, 1933, the USA reversed course and ratified the Twenty-First Amendment, repealing prohibition and once again making it legal to possess and consume alcohol. 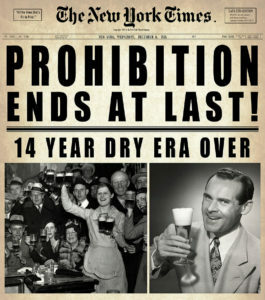 Many folks celebrate Repeal Day each year on December 5, choosing to acknowledge the date when the Twenty-First Amendment was ratified by the states. Here at Summit Brewing Co., however, we celebrate Repeal Day on April 7 — the date when, in 1933, President Franklin Delano Roosevelt signed the Volstead Act into law, legalizing 3.2 percent beer. Another reason we recognize Repeal Day on April 7 is because it’s also National Beer Day. First celebrated in 2009, this beautiful beer holiday also has its roots in the repeal of prohibition and we feel the dual celebration is just too irresistible to pass up. Besides, we don’t want to wait another eight months to celebrate in December. 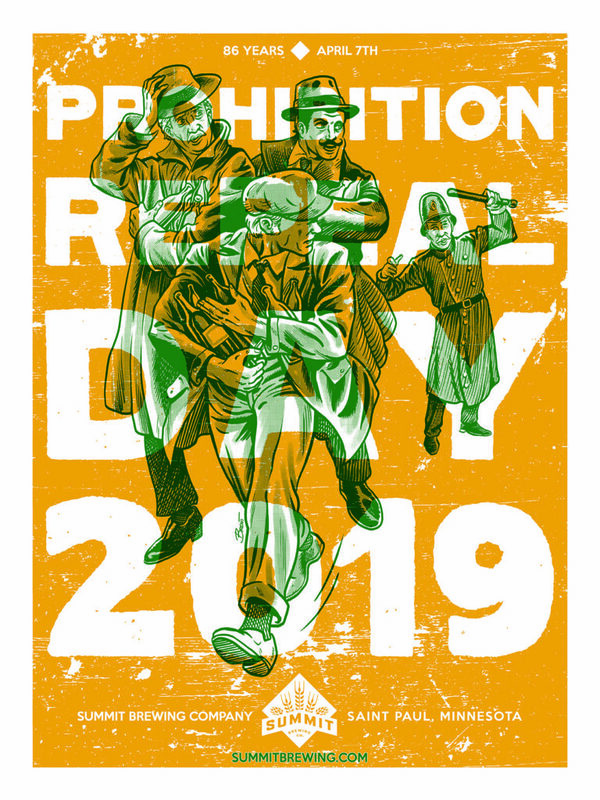 Each year since 2009, Summit Brewing Co. has recognized the Repeal of Prohibition by partnering with a Minnesota artist to produce a limited-edition, commemorative screen-print poster. This year, to mark the date’s 86th anniversary, we’ve teamed up with Minneapolis illustrator Brent Schoonover. A graduate of the Minneapolis College of Art & Design with a BFA in Illustration, Brent has worked with such clients as General Mills, Random House, Target, Walmart, United Airlines, NFL, Disney, and Lucas Arts. He has also worked on several comic books for Marvel and DC Comics. Drawing stories for such characters as Batman, Superman, Captain Marvel, Ant-Man, Suicide Squad, and The Punisher. He lives in Golden Valley, Minnesota with his wife Nicole, two daughters Josie and Millie, and too many animals to name. This year’s outstanding Repeal Day Poster is available for purchase but only in person at the Summit Gift Shop. Posters are priced at $30, and each comes signed and numbered. They’re limited, too, so visit us starting Saturday, April 6 for your best shot at taking one home. Finally, stay tuned to Summit Brewing Co. on social media, as we’ll be giving away a few signed and numbered posters to some lucky beer fans. Plus, we’ll be announcing when you can meet Brent when he visits the Ratskeller later in April.